During the fruit season, visitors are welcome to come and see how fresh fruit and vegetables are packed, and to buy fruit at very reasonable prices. 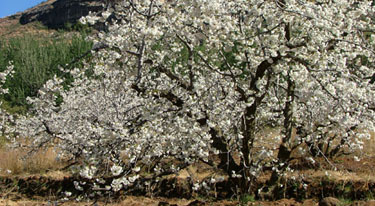 The cherry trees are in blossom from about 5 to 20 September and visitors to the farm will have the opportunity of strolling through the orchards and delighting in the breathtakingly beautiful sight of the trees covered in white blossoms. Cherries are ripe from about 20 October to the end of November, while plums are picked from the beginning of December, and peaches harvested until the end of January, after which vegetables such as courgettes, beans, etc are brought in. Set in a tranquil, shady spot is a tea garden where delicious refreshments are served. Guests can enjoy a barbeque in the lapa and refresh themselves in the a swimming pool filled with spring water. There is also a fully-licensed restaurant where meals for functions and lunches for large groups can be served. BenNevis also caters fors weddings and the farm’s unique mountain chapel will make any wedding held there it a truly memorable occasion. Ben Nevis is a paradise for birds, with large lawns and an established one-and-a-half-hectare garden. There is an excellent 18-hole golf course only eight kilometres from the farm, a dam for angling six kilometres away, as well as an interesting hiking trail twisting up the mountain. There is a walking trail on the slopes and on top of the Clocolan Mountain. It takes more or less four hours to complete the 8km-long circular route, which is moderately difficult. There is bushmen art to be seen along the way and there are spectacular views of the Maloti Mountains and surrounding areas to be enjoyed on top of the mountain. Magnificent sandstone rock formations are typical of this area and many indigenous trees can be seen on the way.